I had so much fun preparing for Little Miss Cupcake’s Christening. I had a vision in mind for something very small and intimate in sort of a shabby-vintage-Southern theme. What does that mean exactly? Well, I wanted to incorporate soft pinks and greens using these great vintage fabrics I found on Etsy from a shop called Dreamy Vintage Sheets but I also wanted it to have a sort of Southern feel about it too. My in-laws are tried and true Southerners. They grew up in a tiny town called Elizabethton in Tennessee (same place Jason Witten is from y’all) but now live in Virginia. My mother-in-law thinks I am a Southern Belle reincarnated…such a lovely compliment! I am a fifth generation Angelino but I am not a big city girl. I never felt comfortable living the big city life in Los Angeles. Friday or Saturday nights I could be found at Loyola football games rooting on my favorite Cubs. I have always been a suburbia type of girl. Anyway, I wanted to honor my husband’s family with a nod to the South. Who else do you look to for Southern inspiration but Paula Deen? I love that lady. Her recipes never fail me and she cracks me up. I almost always have at least one Paula recipe…this time I made Lemon Blossoms & Cheese Straws and according to Paula it is not a Southern luncheon without cheese straws. Below are some pictures of the party and here you can find the recipes. First, let’s talk about decor. I found this beautiful vintage tablecloth on Etsy which matched everything so perfectly. My husband made that shelf for me because I am always complaining that my tablescape needs some height. I had him paint it white instead of pink so that I can use it for other parties. I love how it turned out. So simple and easy to do. Thanks Hubby! The flowers came from this great flower mart here in Carlsbad. I got a ton of flowers for $55. I was pretty happy with what I walked away with. The cylindrical vases the flowers are in came from Dollar Tree…you can’t beat a buck for each. All of the serving pieces I already had. Some were wedding gifts and others were purchased from HomeGoods for previous parties. I like to buy white serving pieces because they can be used over and over. Pedestal platters like the one the Prosciutto Mango bites are on are perfect because you can easily swap out the ribbon to match your event. The Christening napkins were found at Party City months ago in the clearance section. Was just meant to be. There is a long story about how these poured fondant mini cupcakes came to be but I will spare you the details. Let’s just say these were supposed to be beautiful little petit fours covered in pink poured fondant. I will never, NEVER, try making petit fours again. Epic fail. Ugh. That’s a whole other soap opera though. You can read the highlights in my recipe notes section here. My BFF (and Miss Cupcake’s Godmother) flew down from San Francisco early so she could help put this party together. I am not exaggerating when I say, “I couldn’t have done it without her.” She saved my sanity at 11pm when we had to come up with something to serve other than the failed petit fours. Anyway, the mini cupcakes were a huge hit. We colored fondant pink, rolled it out, and made what looked like little caterpillars, flattened them, and then rolled them to look like little rosebuds. They turned out perfectly. If you have the patience and the time to make poured fondant I would recommend it. This was my first time using that method but am confident I could do a much better job the second time around. At 1am you aren’t as concerned with perfection as at say, 9pm. They tasted great and my mom thought Martha Stewart had snuck in during the night so, there you go. Success! Close up of mini cupcakes. I always have doilies on hand because you never know when you are going to use them. To make them fit on the plates I cut a slit up to the middle and then “cored” the middle by cutting a little circle. These were made with a Styrofoam ball purchased at Michael’s and covered with punched pink metallic cardstock. I used the Martha Stewart hydrangea punch also purchased at Michael’s secured with corsage pins. While these are pretty they are not inexpensive to make even with coupons. Corsage pins are not cheap! I wanted to try making these because I have always admired them but don’t know if I would use this technique again unless I found corsage pins for a really great price. The cardstock I already had so saved money there. I will be selling these in my Etsy shop so if you are interested let me know. I also made silk flower poms. Never again. I burned my fingers something fierce with the glue gun. 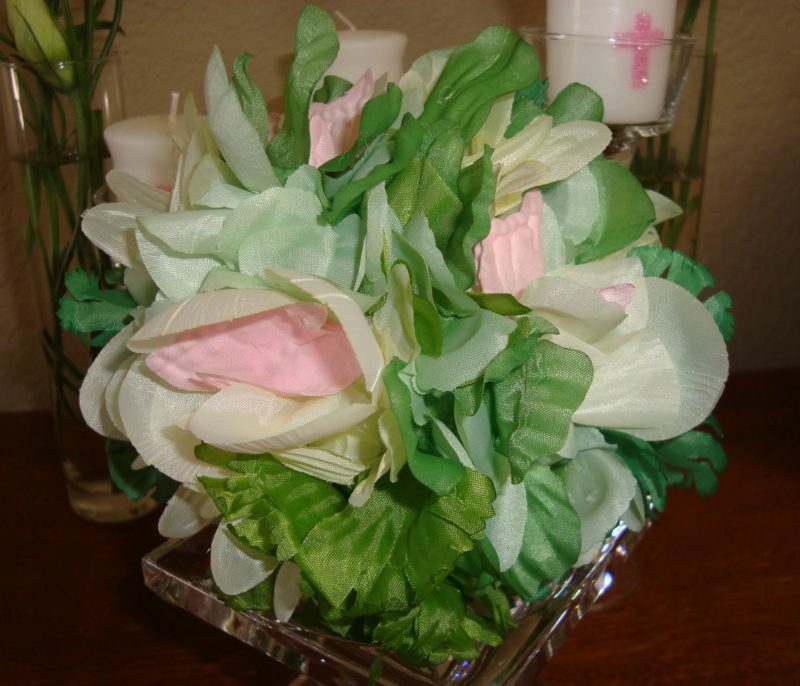 I found a box of green silk flowers and another smaller box of pink butterflies in the clearance aisle at Michael’s. Together with my 20% off everything coupon they were a good deal. I only made two because, well, it hurt! I could have used craft glue or something like that but I needed them to dry instantly and stay put. These were not my favorite decoration. A lot of work but not really worth it. Filed away in the been there done that pile. I found this beautiful Irish Baby Blessing and knew I had to use it somehow. I made cards for guests to fill out blessings, advice, or well wishes for Miss Cupcake. The flower pick was made out of a Bravissimo wand, on clearance, at Michael’s. That cross graphic was used throughout from the invitations to the thank you notes. Beautiful flowers from the Carlsbad flower mart. FYI, they are not open on the weekends. Paper straws were found on Etsy and the flags I designed and made using a full sheet of white labels. Fabric banners made from vintage fabric found on Etsy. A short tutorial can be found here. This is wonderful! Nice work 🙂 looks like it should be in a magazine. Beautiful. Can you please post the tutorial for the fabric banner? I am attempting to make one, and am feeling a little overwhelmed. Thanks.